King Abdullah University for Science & Technology (KAUST) in Jeddah, Saudi Arabia. 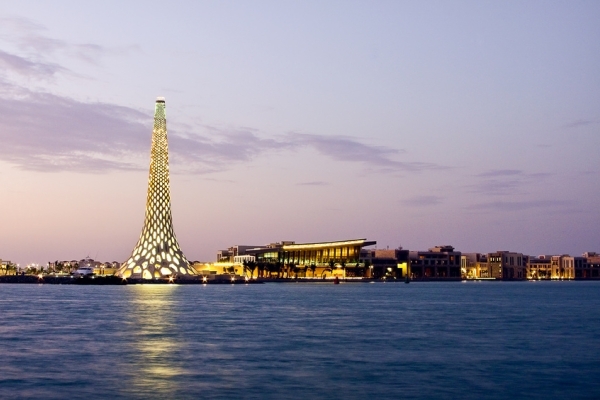 ‘Breakwater Beacon’ – a 60-metre-tall tower overlooking the Safaa Harbour and the Red Sea. A feat of engineering, the tower is part of an international arts program curated by Urban Art Projects’ (UAP). Designed by UAP Principal, Daniel Tobin the Beacon is a “contemporary interpretation of a lighthouse” with a intricate construction made up of ‘amorphous hexagonal’ pre-cast concrete blocks. Image courtesy of Urban Art Projects.